Small spaces in homes provide wonderful opportunities to create a spot where one can relax, think, read, or nap. Decorating these spaces can seem daunting, but we have some wonderful tips for you. First, there are several strategies you can use to make your space seem larger. Start with choosing the correct floor type to enhance the dimensions of your room. Wood-look porcelain tile gives a room classic style of wood without high levels of maintenance. Avoid soft flooring choices as they will dampen sound and will make the room feel dramatically smaller. Choosing the right type of furniture is key to the feeling of spaciousness and functionality of the space. Multipurpose furniture such as an ottoman or a desk that converts to a craft station or vanity is ideal. Also, consider sofas and armchairs that are on raised legs. This will enhance the feel of light and space. Vintage furniture is another fun and space-saving option. Vintage furniture tends to be smaller and provides a high level of interest for the size. Floor-to-ceiling and wall-to-wall bookshelves push the wall and ceiling out creating the feeling of more space and are great for added storage. Next, wall color and lighting both can make your space appear larger. 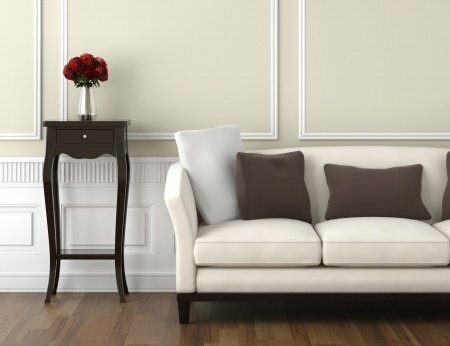 Neutral or light colors are the most effective in small spaces. If there is a window, consider matching the wall paint to the outside colors; this will also make your space seem larger. Utilize as much natural light as possible; natural light opens up a space. A few other options to consider are mirrors and curtains. Mirrors, strategically placed, can add dimension and beauty to a small space. If you have curtains, consider matching them with the wall color, this will avoid contrast in the room. Another benefit of curtains is that you can place the drapery rods close to the ceiling, which makes the ceiling seem higher and the space larger. Finally, one of the benefits of a small space is having that cozy spot to get away and relax. Try creating an in-home retreat for reading or unwinding away from the rest of your home. Small spaces can be the perfect spot to occasionally shut out the rest of the overwhelming world!